My dad (aged 75) has been diagnosed with bile duct cancer – advanced stage. He has Hepatitis B, so the liver is functioning at only 20% of normal capacity. The oncologist has suggested chemo as the only option and it is scheduled on the 14th of June. My family and I are trying to explore other options, or at the very least, want him to be nourished and protect the body from the ill-effects of chemo. Would you be able to help? I am based in London, but I am heading back to Kuching early next week. Looking forward to hearing from you. Best regards. I hope this finds you well. I got in touch with you earlier about my dad. Sadly he lost the battle with cancer. He went down the chemo route and we lost him pretty soon after. A friend of mine who is based in America (HK Chinese born in the UK) is wondering if you are able to help her friend who has just been diagnosed with stomach cancer stage 1b. This will be reconfirmed soon after a laparoscopy surgery which is scheduled to take place soon. My friend is now in HK to sort out a few personal thing and is wondering she could visit you in Penang in the next week or so to get some help for her friend (based in the US). She has all the relevant information with her including medical records. Please could you assist? Blessings. Good day! My cousin sister’s husband who is only 32 years old is suffering from sarcoma, final stage. He was diagnosed with it in late March (due to coughing non-stop) and is now in final stage. They just got married last year and my cousin sister just gave born to a baby boy (one month old). He has undergone treatment (previously surgery done in China) and chemotherapy (for 1 time) only in GMC. His condition deteriorate after the chemo while my cousin was in confinement. He couldn’t walk now due to edema. I came across your blog and I am impressed with your ideology, probably we can alleviate the condition by using herbs. I myself believe herbs can create miracles. There must be something which can help to suppress the development of sarcoma or even reduce the extension of it. It’s sad to see a good family in bad shape. Hope to receive your feedback. Thanks. I myself believe in herbs. I would like to ask can he take both, meaning undergoes chemo and take herbs at the same time? Which means you only help those who don’t do or has stopped chemo? Reply: Better… anything wrong they all blame me not the chemo. Many people write to ask me if they should undergo chemotherapy or not. No, I cannot and would not answer such question. Read what chemo is all about and you make your decision. In this way, if there is something wrong, you or others around you, cannot blame me. Bile Duct Cancer: Go find a good surgeon to help you! Kat (not real name) is a 64-year-old Indonesian lady from Aceh. Her problems started about three weeks ago when she felt dizzy and had abdominal pain. 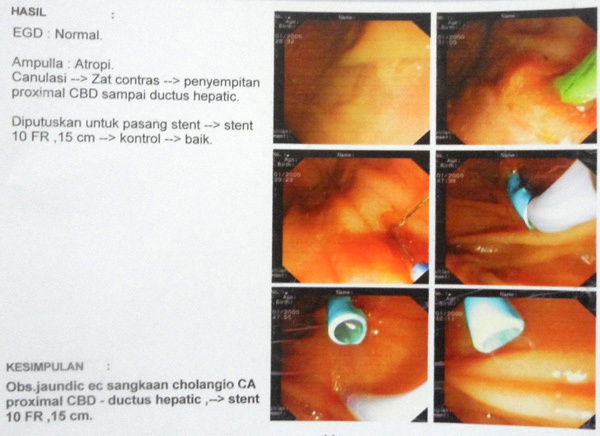 A doctor in Aceh did an USG and said there was something in her gallbladder. a lesion in the region of bifurcation of the common bile duct. It measures 42.4 x 50.0 x 24.5 mm. Para-aortic lymph node was enlarged, measuring 52.7 x 49.0 mm. Diagnosis: Klatskin tumour with biliary obstruction and para-aortic lymphadenopathy. Her blood test results are as below. The attending surgeon, Dr. B suggested that Kat undergo a procedure to install a metal stent to relieve the blockage. This procedure would cost about RM6,000. Yes, should go ahead with the stenting procedure. It is better not to wait for too long because your bilirubin level is already too high (see above). The problem associated with stenting is that blockage can occur again after a few months (and for the unlucky ones even within a few weeks). Because of this it is wiser to use a plastic stent first instead of a metal one. I cautioned Kat and her family that it is important that they go to a “reputable” doctor who is known to be able to do a good job. Not long ago, I had a case where the patient’s gallbladder was removed only to be told later that she had Stage 4 liver cancer! You don’t want to go to such doctor. So we have to be careful. From the feed-back from patients, I know that Dr. A could do a good job! Kat should see him first before agreeing to let Dr. B do the procedure. A had done an excellent job for Bak, a patient who is also from Aceh. A stent was installed for his blocked bile duct. Every 5 to 6 months, Bak had to come back to the hospital to change the plastic stent. After 4 or 5 changes, everything was okay. And the good part of this story is that this surgeon did NOT object or did not get angry when Bak refused to undergo chemotherapy. Bak told the surgeon he wanted to take herbs instead. And most important of all, today, Bak has no more problem with his cancer! Bak’s wife came back to our centre one day and told us that her husband can now live a normal, healthy life. A few days later Kat and her family came to see us again. The stenting procedure was done by Dr. A as suggested. Kat went into the operation room at 6 pm and was out by 7 pm. The procedure cost RM 3,890. She was discharged the next day. Note: Let me be clear that we did not receive any monetary reward for referring Kat to Dr. A or any doctor for that matter. After all done is done, Kat and her family wanted to pay us our consultation fee! Our answer: Free-of-Charge! Our reward this morning was to be able to see Kat to being treated well. From the facial expressions of those who came, we knew that they were very pleased. Our little advice had helped them a lot! Praise be to God! Klatskin tumour is a type of cholangiocarcinoma or a tumour of the bile duct system. It occurs at the confluence of the right and left hepatic bile duct. It is named after Dr. Gerald Klatskin. See illustration below. The tumour blocks the drainage of the bile duct giving rise to symptoms such as jaundice (yellowing of the skin), bilirubinaria (dark urine), pruritus (itchy skin) and abdominal pain besides weight loss. What is the cause? Don’t know. Sixty-six year-old Ray (not real name) was a smoker since age 17. He stopped smoking when he was 58. In 2004 (61 years old), Ray was diagnosed with stomach cancer and underwent a subtotal gastrectomy followed by 6 cycles of chemotherapy. This was followed by radiotherapy. In 2007, his PSA was at 7.29. TRUS guided biopsy was done which revealed prostate cancer, Gleason 3+3. Ray underwent prostrate surgery. In 2011, Ray underwent another surgery to remove his gallbladder. Biopsy indicated no malignancy. However, in early 2012, Ray had high grade fevers and was jaundiced. His liver function enzymes were elevated — Alkaline phosphatase = 433, AST = 87 and ALT = 161. Ray underwent an ERCP with SEMs placement. Later, a tumour was found in the lower bile duct. There is no medication for him. Chemotherapy would only provide a 20 percent chance of success. 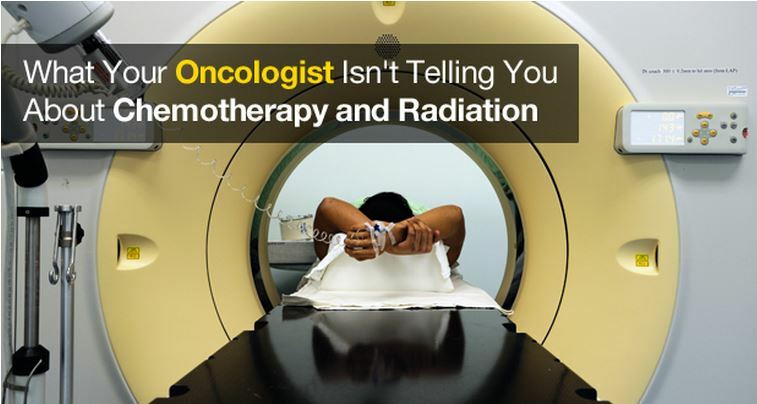 Cyberknife procedure may be a consideration. They consulted three doctors. One doctor said Ray have only a few months to live, maximum 7 months. An oncology surgeon said if it is a bile duct cancer, maximum 30 months but if the tumour grows and blocks the duct then he would not last long. The third doctor gave him a year at most. Ray’s son found CA Care in the internet and wrote us. Later, his son-in-law came to seek our help. Watch this video. This is the story written by Ray’s son. I just wanted to narrate my father’s journey with cancer and our personal experience with alternative treatments. My father was first diagnosed with Stomach cancer in 2004 and whilst it was a tremendous shock to us we were a bit ignorant about the cancer (which probably helped us at that time). Anyway, he underwent surgery followed by chemotherapy and radiation treatments. He was lucky to be a stomach cancer survivor and made changes to his diet and lifestyle (gave up smoking). He was then diagnosed with prostate cancer in 2007 and again underwent surgery and recovered from that successfully. To our horror he was diagnosed with Bile Duct cancer in March 2012 (albeit he did revert back to a more unhealthy lifestyle in 2011, which included alcohol, meat and fried foods). In April 2012 the doctors put a self expanding metal stent to alleviate issues of bile flow and subsequently when his condition improved a bit they looked at the possibility of surgery. However, once on the table the surgeon decided that surgery was not possible. The doctors attending to him had mentioned a prognosis of 3 to 6 months to me. Without surgery my understanding is that conventional medicine does not offer many solutions and quality of life was a key consideration in our decision. Therefore, as a last resort we turned to alternative medicines. I spend my time between Australia and India. My focus last year in April was entirely on finding him the best alternative medicines that are available (and with some body of knowledge behind them). 3) Ayurveda treatment from DS Cancer research in India. Albeit I started Dad on the Ayurveda in Sep 2012 more as an insurance policy. He was already feeling better before then. This is run by a botanist in Malaysia called Chris Teo and he has had great success in healing people (he doesn’t believe in a cure) with cancer and Dad has his herbal teas on a daily basis. Protocol is provided by Chris. Also, he is very focused on diet and red meat, fried food, dairy, alcohol and processed sugar are definitely not allowed. My father has a good quality of life (90% of any one of us) and apart from the occasional infection due to the stent, his blood reports (tumor markers have remained down and Liver Function test is mostly in normal range) and scan on his 1 year anniversary has also provided a clean bill of health (i.e. scan said stable disease). The future is always uncertain but I really wanted to share my personal experience with everyone who might be struggling with this disease and wish you all the best. Latest update 2015: It has been 3 years plus and this patient is still doing okay. This is an e-mail Ray wrote in June 2015. Over last three years have lost over 22 kg, current weight 54 kg. I am 5feet 11 and normal weight was in 70s. Doctors looking after my day to day issues including Bile Duct stents, have been strongly advocating putting on some weight to counter disease plus new developments. My diet is mainly vegy, little fish sometimes, no sugar, salads and fruits of all types. Cooking media is olive oil mainly and sometime a coffee or tea to feel normal. My father passed away yesterday night as a result of his cancer. He was bed ridden towards the end, however, he did not suffer pain which is associated with the disease and was able to eat and drink small amounts to his last day (including some of your tea). I wanted to give you a heartfelt thank you as your medicines have certainly provided us with much cherished time with our father. He was diagnosed in March/April 2012 and the time we have had with him has been very precious. Regards, Rahul. Please take note: Patient was given 3 to 6 months to live but he managed to live a happy life for more than 3 years. This is what we mean by we cannot cure any cancer — neither can anyone on earth! Comments: According to medical literature, median survival of liver cancer patients without medical treatment is 1 to 4 months. Prognosis worsens without increased tumour size. Patients with tumours larger than 6 cm have a mean survival of 3.5 weeks. Generally patients who come to us are often told that they only have 6 months to live. Hass (not real name, M847) is a 44-year-old male from Indonesia. In early 2010, he had jaundice. The doctor suspected this was due to Hepatitis. Hass was prescribed medication. After a month, the treatment was not effective. Hass went to a private hospital in Kuching. A CT scan on 28 January 2010 indicated a 6 mm stone in the gallbladder. There was a 1 cm hypodense lesion in segment 8 of his liver. This could be just a cyst. The common bile duct was dilated. The maximum diameter was 16 mm. There was a 18 mm mass at the distal common duct. Conclusion: Mass in the lower common duct with biliary obstruction. Immediately Hass underwent an operation to remove his gallbladder and the bile duct tumour. The histopathology report dated 3 February 2010 indicated: infiltrating moderately differentiated exophytic adenocarcinoma of bile duct, invading through entire thickness of the wall and metastatic to periductal lymph nodes. Margins of excision free of tumour. An ultrasound of the abdomen on 8 June 2010 showed no evidence of tumour recurrence although his CA19.9 increased from 52.4 (in March 2010) to 1420.0. 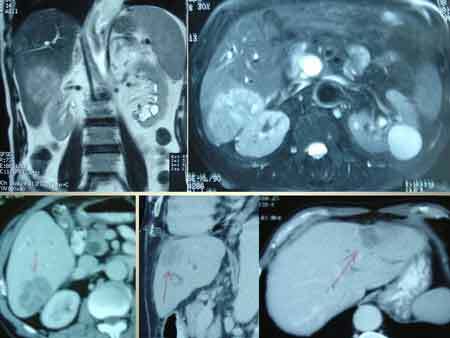 A CT scan on 9 June 2010 indicated a 15 x 10mm lesion in segment 7 of his liver. The 10 mm cyst in segment 8 of his liver remained the same. In addition there were a few paraaortic lymph nodes noted from the celiac axis down to the liver of the renal hilum. The largest node measured 20.0 mm – the others were subcentimeter. The doctor told Hass that the cancer had recurred and he was unable to help him anymore. Hass was asked to undergo chemotherapy. But he refused. Below is a table showing the rise of CA 19.9 markers from March to October 2010. Hass came to see us in Penang on 8 October 2010. Listen to our conversation. Attached to the liver, is a pear-shaped structure called the gallbladder. The liver makes bile and this is transported to the intestine by a long tube-like structure called the bile duct. The gallbladder is attached to the bile duct by a small tube called the cystic duct. 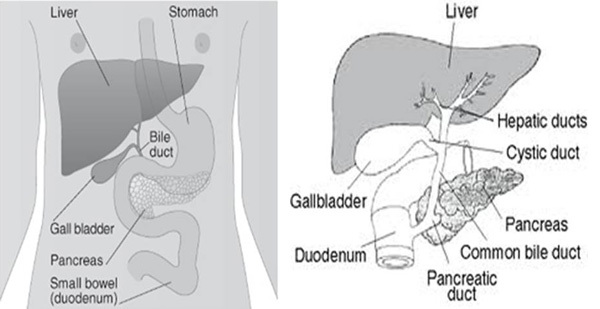 The top half of the bile duct is associated with the liver while the bottom half of the bile duct is associated the pancreas through which it passes on its way to the intestine. Blockage of the bile duct by a cancer prevents the bile from being transported to the intestine. When this happens the bile accumulates in the blood giving rise to jaundice. The skin and eyes becomes yellow. This condition may also cause severe itchiness. In the part of the bile ducts contained within the liver. This is known as intra-hepatic. In the part of the bile ducts outside the liver. This is known as extra-hepatic. In the duct between the left and right portal veins. This is known as hilar bifurcation. 60%-70% of cholangiocarcinomas occur at the hilar bifurcation. 20%-30% in the distal common bile duct. 5%-15% within the liver (intra-hepatic). 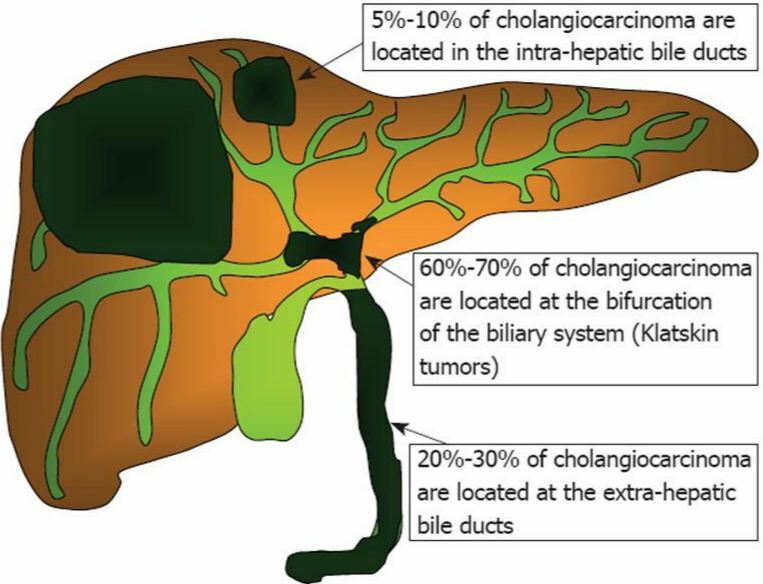 Patients with extrahepatic tumors usually present with painless jaundice due to biliary obstruction, while patients with intrahepatic tumors usually present with pains, pruritus (66%), abdominal pain (30%-50%), weight loss (30%-50%), and fever (up to 20%). 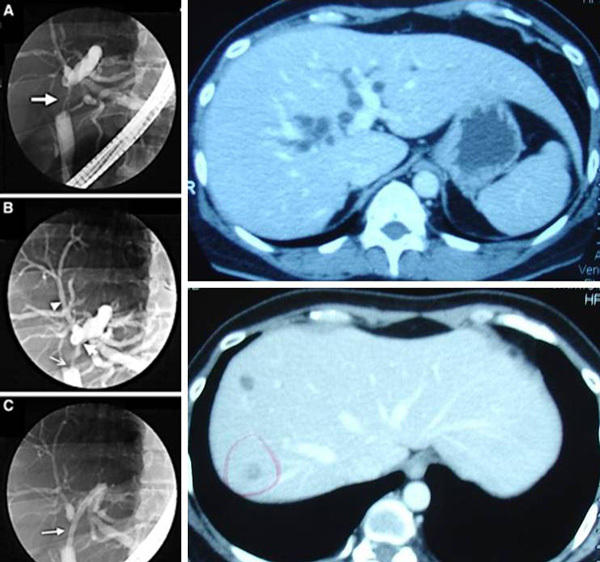 The majority of patients with cholangiocarcinoma presents with unresectable,advanced stage disease and have a survival of less than 12 months. Cure rates are low, even with aggressive therapy. The average 5-year survival rate is 5%-10%. Surgery remains the only intervention offering the possibility of a cure. But the treatment goal should be complete excision with negative margins. All patients should be fully evaluated for resectability before any type of intervention is performed. Neoadjuvant and adjuvant therapies have not improved survival in patients with this tumor. Since the prognosis for unresectable patients is poor, palliative measures should be aimed at increasing quality of life first and increasing survival second. Among selected patients who undergo potentially curative resections, 5-year survival rates are generally from 8%-44%. The importance of achieving a margin-negative resection cannot be overemphasized. The 5-year survival rates were greater when a negative margin was obtained, 19%-47% versus 0%-12%. Distal lesions represent approximately 20%-30% of all cholangiocarcinomas and are usually treated with pancreaticoduodenectomy (Whipple procedure). Achieving a margin-negative resection is also important with these tumors. The 5-year survival rates in selected patients who underwent curative resections is 21%-54%. Intrahepatic cholangiocarcinoma is usually treated by hepatic resection. Three-year survival rate of 60% was reported in patients who underwent a margin-negative partial hepatectomy. Chemotherapy has not been shown to markedly improve survival in patients with either resected or unresected cholangiocarcinoma. The majority of reports use 5-FU alone or in combination with methotrexate, leucovorin, cisplatin, mitomycin C, or interferon alpha. The 5-year survival rates were not significantly different between patients who received chemotherapy and surgery and those who received surgery alone. Cancer arising in the extrahepatic bile duct is an uncommon disease, curable by surgery in fewer than 10% of all cases. In most patients, the tumor cannot be completely removed by surgery and is incurable. Palliative resections or other palliative measures e.g. stenting procedures may maintain adequate biliary drainage and allow for improved survival. Surgery may be used to remove the cancer if it has not spread beyond the bile duct. It is not always possible to carry out surgery, as the bile duct is in a difficult position and it may be impossible to remove the cancer completely. There are different surgical procedures depending upon how big the cancer is and whether it has begun to spread into nearby tissues. Removal of the bile ducts. If the cancer is small and contained within the ducts, then just the bile ducts containing the cancer are removed. Partial liver resection. If the cancer has begun to spread into the liver, the affected part of the liver is removed, along with the bile ducts. Whipple’s. If the cancer is larger and has spread into nearby structures, then the bile ducts, part of the stomach, part of the duodenum, the pancreas, gall bladder and the surrounding lymph nodes are all removed. Bypass surgery. Sometimes it is not possible to remove the tumour. Other procedures may be performed to relieve the blockage and allow the bile to go into the intestine. The jaundice will then clear up. Stent insertion. One way to relieve jaundice without a surgical operation is to perform ERCP (Endoscopic Retrograde Cholangiopancreatography). This procedure involves insertion of a tube, called a stent into the blocked bile duct. The stent clears a passage through the bile duct to allow the bile to drain away. The tube usually needs to be replaced every three to four months to prevent it becoming blocked. If the tube does block, recurrent high temperatures and/or return of the jaundice will occur. Non-surgical stenting is regarded as the first choice of palliation for patients with short life expectancy. For patients with longer projected survival, surgical bypass should be considered. Palliative resections may be beneficial to patients with distal and hilar bifurcation. The fact is very clear. 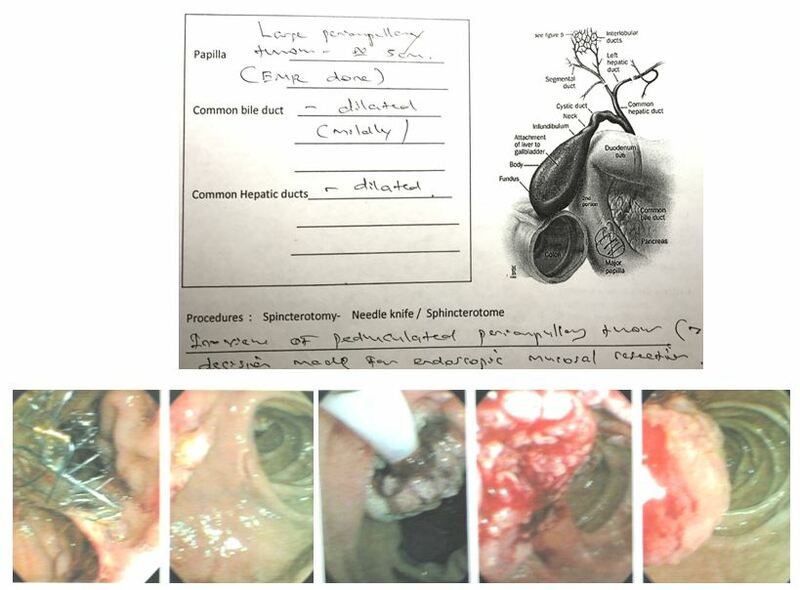 Surgery for bile duct cancer in this case is an absolute failure. Is this failure a rare event? Probably NOT! A surgeon told his liver patient: “For ten liver operations that I performed, nine patients died”. Good information indeed but the problem is that he made this comment some three years too late. This patient had already undergone the operation and had suffered a severe recurrence. According to the literature, not all patients with bile duct cancer are suitable condidates for surgery. “All patients should be fully evaluated for resectability before any type of intervention is performed”. To what extent is this evaluation done?